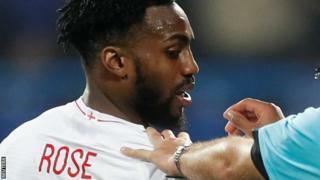 Danny Rose made his England debut in 2016 and has 26 capsTottenham's Danny Rose can overcome his feelings of resentment towards football and become an inspiration for future black players, Jermaine Jenas has told BBC Radio 5 Live.England left-back Rose, 28, "can't wait to see the back" of the game because of the lack of action on fans' racism.Jenas said Rose had a "responsibility" to stand up to abuse like John Barnes and Cyrille Regis did in the 1980s. "Danny should cherish being a player," his friend and former team-mate said. "All that passion he has, in order to get away from hatred, should be turned it into a position where young black players can look at him and know it's going to be easier for them by the time they become professional footballers." "How I programme myself is that I think I've got five or six more years left in football, and I just can't wait to see the back of it. "Seeing how things are done in the game at the minute, you just have to get on with it." Former Tottenham midfielder Jenas, who said he keeps in touch with the player, said he was surprised by the stance.The 36-year-old told BBC Radio 5 Live: "I come from an era when [ex-Liverpool and England player] John Barnes was my hero. "Along with [ex-West Brom and England striker] Cyrille Regis, it was an era when racism was rife - those players stood up to that. "They handled it professionally, where they brought the game massively forward to allow the likes of Danny and I to play where it's nowhere near as bad. "I feel like Danny and [Manchester City and England winger] Raheem Sterling, who has taken the mantle, have a responsibility to continue that message, to stand up to it. Not wanting to turn your back."